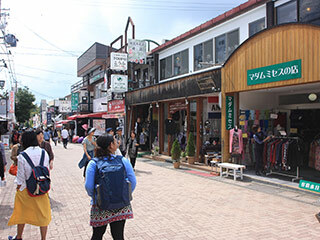 Karuizawa Shopping Shiki Tour (四季の旅・軽井沢ショッピング) is a great and reasonable tour to visit Karuizawa and enjoy shopping at one of the best outlet mall. It is a easy one day bus tour. You don't have to worry about buying too many things overthere, and you can even drink because it's a bus tour. Karuizawa is very far to visit with public transportation, but Shiki Bus Tour make it so easy for you. Kyu-Karuizawa Ginza, also known as Kyu-Karuizawa main street, is the shopping district located in Karuizawa, Nagano. It has about 500m long and many fashion shops, gift shops, and restaurants. Karuizawa is very famous for travel spot during the summer because the temperature is very low even in summer. Right now, there is Shinkansen Station, so many people visit here for all seasons. Karuizawa Outlet Mall is one of the largest outlet shopping mall in Japan. There are 137 outlet stores out of 217 stores and 30 restaurants and food stand. This is bus tour for both Kyu-Karuizawa and Karuizawa Outlet Mall. You have about 5 hours of shopping time here. You can also enjoy strolling around beautiful Karuizawa town. 2. the guide will take you all the time. So, it will be very safe and easy for the beginners. 3. welcome one person. Seat will be place with the same gender. 4. stop at the Karuizawa station and Kyu-Karuizawa for both shopping. 5. you have about 5 hours of shopping time. 16:00 meeting at Karuizawa Station and leave. 19:00 back to Shinjuku Station.